1) It seems The Gathering brought a lot of new people to Kickstarter. 2) Some people seem to think that because the True Collector tier is sold out, so are the cards. That's not the case. 3) Some people aren't really sure what an add-on is or how to get one. So, let's have a quick Beginner's Guide to Add-Ons! An item that you can add to the pledge you have selected by simply adding the appropriate cost to your pledge total. How do I purchase an add-on? If you've already pledged, the big green button at the top of the project page marked as "Back This Project" should now be a big blue button that reads "Manage Your Pledge". Click that button. Now, select your pledge total and manually add the cost of your chosen add-on to your current total. Click "Continue to the Next Step". Then, after you've checked your new total is correct, click "Confirm". You're done! A couple of weeks after the campaign is over, everyone receives a survey. Besides questions like asking for your mailing address, the survey will ask you to list what add-ons you purchased and this is where you would put the name of the items you've chosen. That's it! No, it's not the most streamlined of processes but add-ons (and stretch goals) are things that have grown out of Kickstarter campaigns over the last couple of years. Kickstarter wasn't built with these additional elements in mind, and it may be awhile before Kickstarter adds some coded functionality to make these processes simpler. So Kickstarter wasn't created with add-ons in mind? Are they going to allow these extra sales? Absolutely. Hundreds of Kickstarter campaigns use add-ons. So I can add anything I want to my pledge? Not quite. 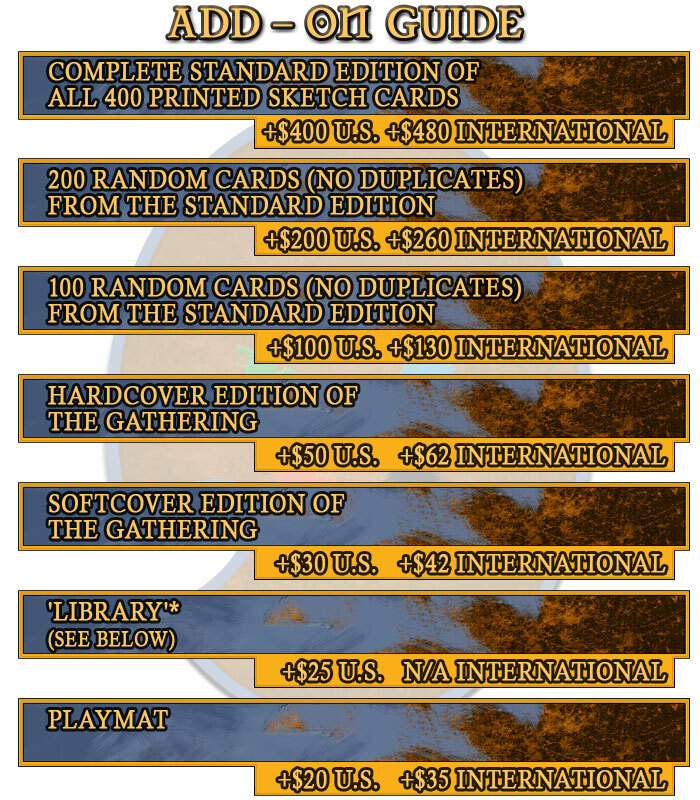 Numbered collector's editions of The Gathering are very limited. We're not allowing anyone to order additional numbered collector's editions as add-ons. Will you put up a page someplace online where people can still buy the "add-on" items even though the pledge drive is over, up until the time they actually get printed? Adding another 20$ for Playmat B so i can get both! W00t! @ Mischa You're right. If you have a second account, you're getting a better deal as you'll get the four free cards with each of the two orders. BUT Kickstarter functions on the idea that each person has one account, and we stick with that internal logic for our offers. @ Wessel. You need to add $124. Every book still racks up shipping costs. BTW, you're only paying $20 instead of $24 for the two in the TWO-HARD tier because it's a thank you, not that it's actually cheaper for us to ship. We still have to sort out a few details with our fulfillment company but it's very possible that each book will ship individually. I want 4 hardcover books I pledged 95 dollar for the 2 books and 20 for the international shipping, now I want 2 hardcover books as addons do I need to add 124 dollars 2x 50 and 2x 12 for shipping or because I aleady paid 20 dollars for shipping the 2 books can i just add 100 dollars for the 2 books? Hmmm... 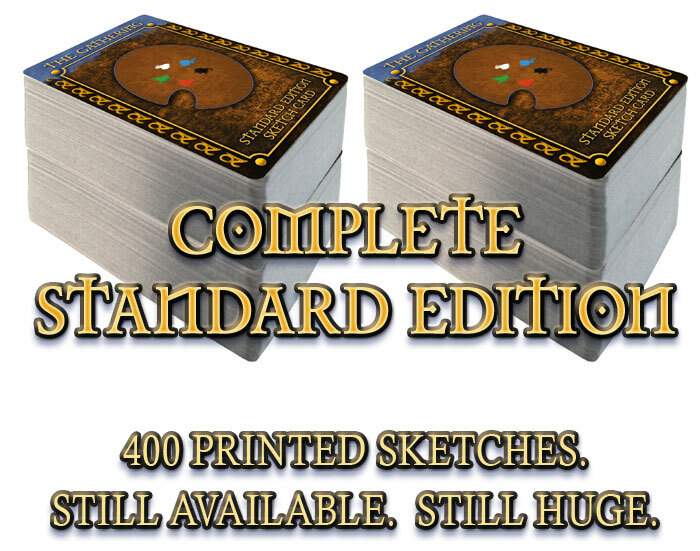 So a softcover Addon costs the same like the standard pledge, but doesn't contain the standard sketchcards? So if I want two complete softcover-standard-sketchcard sets (one as a gift), I have to do two pledges instead of one with an addon! ?